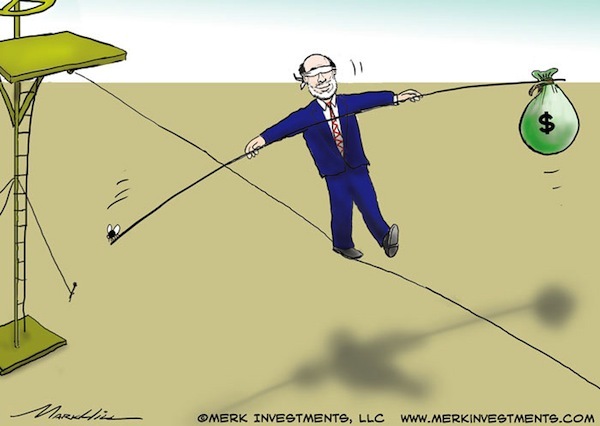 Merk Insights - Taper Talk: Bonds at Risk – Where to Hide? Taper Talk: Bonds at Risk � Where to Hide? Induced by �taper talk,� volatility in the bond market has been surging of late. Is there a bond bubble? Is it bursting? And if so, what are investors to do, as complacency might be financially hazardous. Our internal best bubble indicator is triggered when an asset, or asset class, exhibits volatility below its historic norm. That is, money flows into an asset not appreciating the risks that are embraced. Think tech stocks in the late 1990s. Think housing in the run-up to the financial crisis. Or think Treasuries. The long-end of the yield curve (longer dated Treasury securities) is historically a rather volatile place. In recent years, however, it’s been eerily quiet. This isn’t limited to U.S. Treasuries, but both domestic and many international fixed income markets have rewarded investors with yield, but relatively low levels of volatility. In our assessment, we don’t need the Chinese to dump their Treasuries, but merely for historic levels of volatility to return to the Treasury markets for there to be a rude awakening. That’s because bond prices can fall; an investor in a bond fund is subject to interest rate risk, i.e. the risk of bond prices falling as higher interest rates are anticipated. A lot of yield chasers and other “weak hands” may be holding Treasuries that might flee this market should heightened volatility persist. The recent “taper talk”, i.e. the talk about the Federal Reserve (Fed) reducing its Treasury purchases has provided a first taste of how increased volatility affects bond investors. The Fed has worked hard to contain the long end of the yield curve, amongst others, by communicating to keep rates low for an extended period; by buying Treasuries; by engaging in Operation Twist; and finally, by shifting the Fed’s focus from inflation to unemployment. However, as recent volatility in Japan’s government bonds (JGBs) has shown, it may be harder going forward to smooth talk the markets. The purest way to express a negative view on bonds may be to short them. However, anyone who has ever done so through an ETF or derivative, likely has learned that one better get the timing right. Shorting bonds can be rather expensive, as one constantly has to pay the interest, in addition to the cost of the instrument or vehicle one chooses. We won’t try to talk short-term traders aware of the associated risks out of shorting bonds, but caution that this is not for the faint of heart; we also think it may not be a wise long-term strategy due to the associated costs. An alternative to shorting bonds might be to sell the dollar, where one can tap into other opportunities at the same time; more on currencies later. Moving from bonds to equities? Investors are all too often told they can choose between bonds and equities. More so, with the stratospheric rise in equities of late, anyone not fully invested in equities is likely to have “underperformed”. Independent, however, of whether one thinks that equity prices may go higher, equities are historically more volatile than bonds. As such, when shifting from bonds to equities, one inherently accepts a higher risk profile. To us, this seems like a rotten choice: be stuck with what might be overpriced bonds; or move to equities, where one knows the risks are high. We consider some alternatives. Not all bond funds are created equal. The typical parameters bond managers choose are duration, a reflection of interest rate risk; and credit risk. Some bond managers have the flexibility to adjust, for example, interest rate risk, by shortening the average duration of bonds held. However, few bond managers go below 2 or 3 years in duration, still exposing investors to what might be significant interest rate risk. Anyone who has ever taken the time to read the prospectus of a bond fund, might find that some of them read like hedge fund prospectuses. Indeed, some bond funds are known to heavily deploy derivatives to take bets on the yield curve. The downside of this approach is that one basically buys a black box, trusting the manager to do the right thing. Sure enough, there are some that have played this well in the past. Investors should ask themselves, however, whether they truly understand the risks the managers take; that is, the risks investors are facing. Fearful of interest rate risk, many investors have been chasing credit risk. That is, buying short-term debt of less creditworthy issuers, notably junk bonds. As long as Fed Chair Bernanke is healthy, what can possibly go wrong here? Junk bond yields are near historic lows, as this is not a new idea. More importantly, junk bonds tend to trade more like equities, as they are sensitive to “risk” sentiment in the market just as equities are. As such, enjoy the returns while they last, but don�t count on being “diversified” as junk bonds might tumble just as stocks tumble. Ultra-short bond funds, i.e. bond funds that are committed to the short-end of the yield curve, are back in fashion. It appears 2008 is a distant memory: these funds chase credit, but do so while keeping duration fairly low. As 2008 has shown, however, when the going gets tough, a lot of money can be lost in these markets. There’s this thing about investing in anything other than Treasuries: it’s called risky for a reason, and there�s no free lunch. EM debt markets are small. Yet, a lot of money piled into these markets. As such, in recent weeks, when bond market volatility spiked, many investors ran for the same small door, exacerbating volatility in EM local debt markets. Interest rate risk is as present outside of the U.S. as it is inside the U.S. The typical EM bond fund manager may be likely to choose a bond because of liquidity. In recent years, that�s not been a problem as the volatility in EM bonds was contained. But investors might be faced with a double whammy as investors re-evaluate their “strategic positioning” in the space. “Strategic positioning,” by the way, appears to be a codename for turning a blind eye to certain risks, trying to justify why one has to invest in the same market everyone else appears to be investing in. Emerging markets have responded to the huge demand by issuing more debt. Clearly, we welcome increased liquidity in these markets. But there’s much more needed than more bond issues to have emerging markets mature; for now, there�s mostly a risk that the added debt causes domestic pain in a bond bear market. Corelation. Currencies historically have low correlation to other asset classes. Compared to U.S. bonds, currencies have a near zero correlation or negative correlation (dependent on index chosen). Volatility. Unlike their reputation, currencies are less volatile than either bonds or equities. When the euro moves a full cent, say from 1.32 to 1.33 versus the dollar, on a percentage basis, it�s a rather small move, even if it makes the headlines because it affects major economies. Currencies are perceived to be volatile mostly because many speculators employ leverage. We don�t think leverage is necessary to make money in the currency markets. Alpha. The currency space may be well suited for active management, as non-profit maximizing participants, such as corporate hedgers; central banks or travelers can create market inefficiencies for professional investors to exploit. Directional vs. Non-directional (“long/short”). We group currency investing into two major camps: directional, as in taking a long-term bullish or bearish position on the greenback. For example, central banks have been diversifying to managed baskets of currencies; an investor can do the same in his or her portfolio. Or non-directional (“long/short”), which is taking a position, for example, on the Australian dollar versus the New Zealand dollar. Such a relative position may or may not be profitable, but the returns generated will almost certainly not be correlated to anything else in an investor’s portfolio. Please make sure you are subscribed to our newsletter to be informed when it becomes available. Also, please join us for a webinar that discusses the currency asset class in more detail: click to join our webinar list; our next Webinar is next Tuesday, June 18.